Hola amigos! I am back, after spending quite a few weeks recovering from my jetlag, I am back in business! This month Mexicans are celebrating “Independence Day”, on 16 September, to be precise, so I decided to cook some of my favourite recipes to celebrate this day in style. 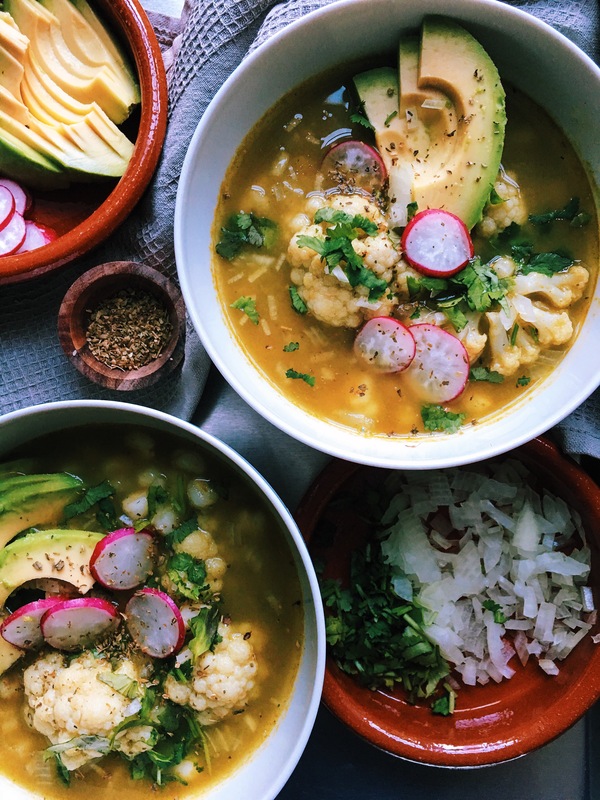 Today I am sharing with you a very hearty this, Pozole Verde, there are many versions of this dish, but traditionally green pozole is made with either pork or beef, but I decided to make mine vegetarian, so I used cauliflower, as it is a very meaty vegetable that absorbs any flavour that it is cooked in. For my recipe I also used cooked hominy, which is easily available in the UK in any of the Mexican online shops. There are other two ways to cook pozole (hominy), you can find all of the recipes in my blog, just click here Red pozole & White pozole but for me green pozole is my favourite as it is made with very fresh ingredients and this time I was very lucky because I found fresh Poblano peppers and tomatillos, so this recipe is the best to make good used of these ingredients! So I hope you like my vegetarian version of this very easy recipe, which by the way, I cooked in no time! Chopped roughly the Poblano flesh peppers, tomatillos, jalapeño pepper, onion, garlic, lettuce leaves and spinach leaves, then put all these ingredients in a blender and add the organic vegetable stock cube, blend until getting a smooth consistency. Once all the vegetables are properly blend, heat a large casserole dish and heat 3 tbsp rapeseed oil in medium heat, once it is hot, add the green salsa and cook for 20 min approx. add some salt if necessary. Then add 3 cups of boiling water to make it into a broth and the dried oregano and continue cooking. In the meantime, take the hominy corn out of the tin and rinse it very well, separating all the grains.Cut the cauliflower head into florets, wash them and leave aside. While the salsa is cooking, prepare all the garnish ingredients: avocado, lime wedges, dried oregano, chopped onion and fresh coriander, chopped radishes. Taste the broth, if it needs more salt or more water add them at this stage, the broth has to be runny and flavoursome. 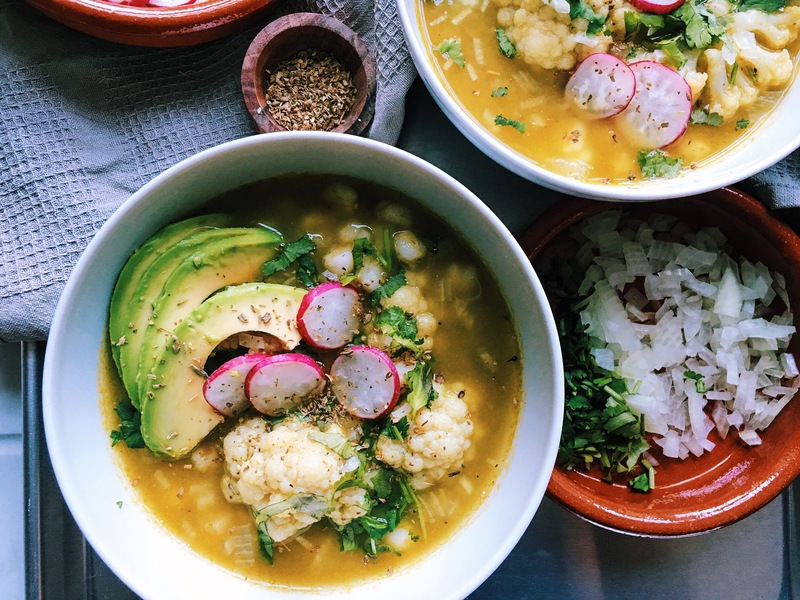 Once the broth is ready, add the hominy corn and the cauliflower florets, cook for 15 min or until the hominy and cauliflower are tender. Serve in a bowl, garnish with avocado slices, radishes, chopped onion, jalapeño pepper and fresh coriander. If you fancy add some shredded lettuce or white cabbage, squeeze a lime wedge and add some spicy salsa. Enjoy! I bought my fresh Poblano peppers and fresh tomatillos in La Tiendita online shop. This is interesting! I’m going to show this recipe to my parents. My dad is on a strict diet because of his diabetes and high blood pressure, and he was sorry he wouldn’t be able to have pozole this year. But maybe we could try this recipe.